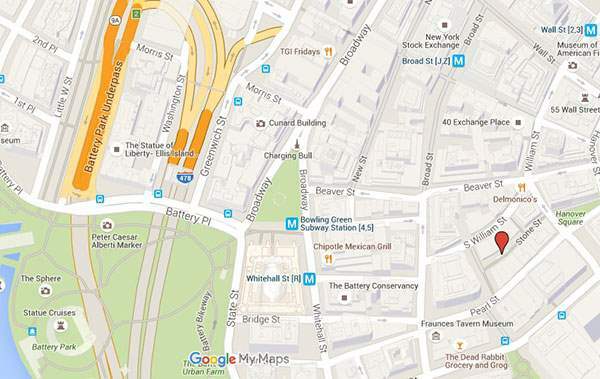 Where can you find some of the best places to eat and drink in Downtown NYC? On a narrow cobblestone street in the heart of the Financial District called Stone Street. So whether you’re taking a free ride on the Staten Island Ferry, visiting the Statue of Liberty and Ellis Island, strolling along Wall Street, or paying tribute at the 9/11 Memorial, a break on Stone Street is a must. Click Here to get this guide as a free PDF in your inbox! This narrow cobblestone street in the heart of the Financial District was the first street paved with stone in the city, back when it was a small Dutch farming and trading colony called New Amsterdam. It was originally paved in 1658, when Wall Street was still a wooden wall built as a protective barrier at the northern edge of New Amsterdam. After decades of neglect in the middle of the 20th century, Stone Street became a seedy, derelict back alley (think crack vials and trash). It was finally restored and repaved in the 1990s and became a Historic District in 1996. 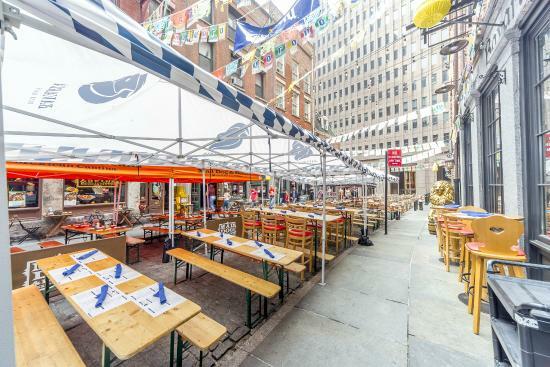 Today, this charming old street, flanked by restored lofts and warehouses from the late 1830s, is one of the best dining destinations in Downtown Manhattan. This is especially true in the warmer months, when restaurants and bars place long wooden tables in the middle of this pedestrians-only street. The whole vibe feels very European and helps you forget that you are on Manhattan island, better known for noisy traffic and countless skyscrapers than old-world charm. Do you want to discover New York’s layers of history, explore its architecture and famous landmarks with a professional guide? 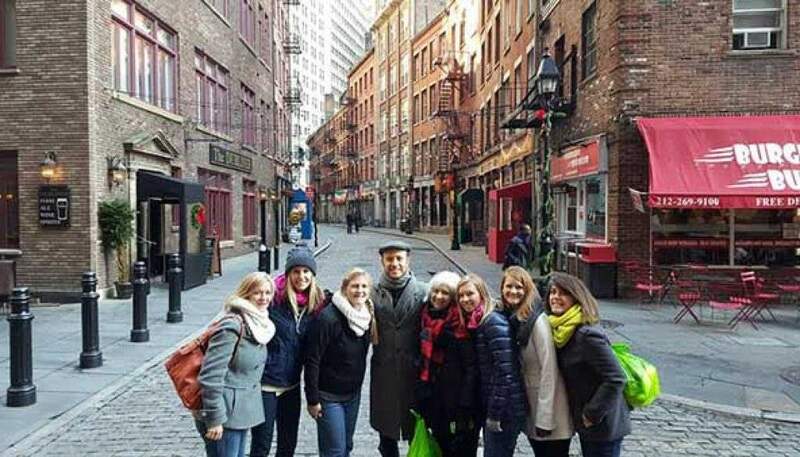 Check out our private Downtown Highlights NYC walking tour, which will include a visit to Stone Street. Or perhaps you’re visiting NYC to see Hamilton on Broadway? Then check out our Hamilton in NYC Walking Tour! The Dubliner is a replica of a classic Irish pub with traditional pub fare, full bar, lots of indoor space, and outdoor tables in the summer. If you’re in the mood for good BBQ and cold craft beer, Route 66 Smoke House is the place for you. Cool off inside or enjoy an outdoor meal on communal tables. Route 66 applies an “all-American” theme to their bar menu by featuring only American whiskey and craft beer. Burgers, beer, wine, rustic wooden décor, and outdoor seating. There are also multiple TV screens with the day’s important games on. Adrienne’s is the best place for pizza Downtown. Enjoy thin-crust brick oven pizza made to order in an inviting and upscale setting. Adrienne’s also offers salads and some baked classics like lasagna and eggplant parmesan. Pair it with a glass of wine or a cold beer. Outdoor seating is available in the summer months. Wine and whiskey lovers rejoice! This intimate dimly lit bar & restaurant features an impressive list of wines and whiskeys from around the world, as well as craft beer and specialty cocktails. The food menu focuses on tapas-style small plates with a heavy Spanish, Italian, and French influence. Underdog is a popular, dimly lit cocktail bar spinning great tunes and serving craft beer and great cocktails, along with a wide variety of bar food — from salads and sandwiches to burgers and lo-mein. Grab a stool at the long bar or a table for larger groups. 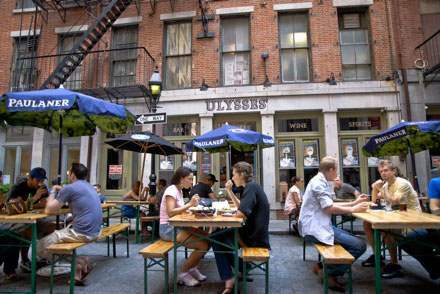 The first pub to open on Stone Street in 2003, Ulysses’ has become a Financial District (“FiDi”) staple. Office workers enjoying happy hour and neighborhood locals looking for a good drink and a bite to eat make this a bustling destination for beer, wine, cocktails, and an impressive food menu that includes a raw bar. So whether you’re clamoring for clams, oysters, a gyro sandwich, or a juicy burger, Ulysses’ has you covered. Enjoy the outdoor seating if you can find a spot on the long communal tables. Financier, which has been a cafe chain in NYC, is a good choice if you just want to get a decent cup of coffee, a fresh pastry, and to use the bathroom, while taking a break from exploring Downtown. 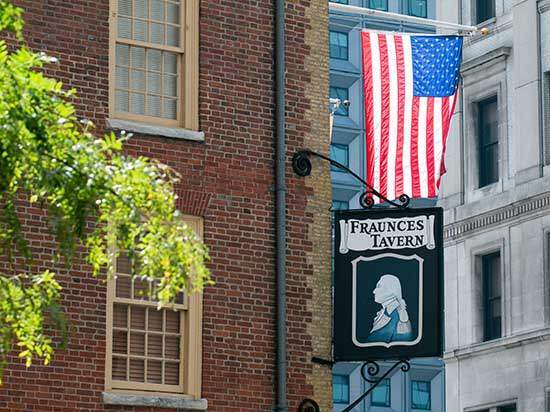 If you like your food, booze, and history in the same establishment, then head to Fraunces Tavern, which is a 2-minute walk from Stone Street. It is one of the oldest and most historic pubs in New York City. Opened in 1762 as Queen’s Head Tavern, this bar has served food and booze to British officers, fervent Sons of Liberty, Revolutionary generals (including George Washington), dock workers, office workers, and everyone in between. In fact, it was here that George Washington gave a heartfelt toast to his generals after Evacuation Day (when the last of the British soldiers occupying Manhattan left after their defeat in the American Revolution). Fraunces Tavern was saved from demolition in 1900 by the Daughters of the Revolution, then restored under new ownership of the Sons of the Revolution in 1907. Today’s building may or may not look like the 18th century version of George Washington’s epoch. The restoration architect couldn’t find a painting of the building before the first major fire in 1832, so its appearance today is based on the architect’s faithful interpretation of colonial-era styles (basically, his “best guess”). Today’s Tavern features a rustic restaurant space, popular for power lunches during the work-week, and multiple bar rooms featuring an impressive menu of craft beers and whiskeys, as well as good bar food. You’ll find wooden decor and even an old musket hanging above one of the bars. After your meal, head upstairs to visit the Fraunces Tavern Museum (open 7 days a week, $7 admission). Check out the Flag room, as well as the recreated 18th century “Long Room”, where Washington would have toasted his officers in 1783 at the victorious end of the Revolution. Harry’s has been a venerable “Wall Street” dining institution since 1972. Today, the beautifully remodeled high-end bar and restaurant in the basement of the historic Italianate India House (circa 1851) still attracts the “Power Lunch” and after-work crowd with an impressive steakhouse menu and a full bar. It’s a great option for a fancy lunch or dinner experience Downtown. Reservations are recommended. The opposite of Harry’s, both in terms of ambiance and price point, is Ruben’s Empanadas. This tiny, casual, lunch spot is a great choice if you’re looking for a tasty, hot Argentinian empanada to eat outside on a nice day or to take to go when pressed for time. If you’re craving a delicious Maine-style lobster roll or some hot clam chowder, head to this hole-in-the-wall seafood joint next to an ugly parking garage just behind Stone Street. The food is always tasty and fresh and they are proud of sourcing traceable, sustainable seafood from the USA. Last but not least, if you just want a quality authentic NYC bagel, head to Leo’s, located just across and perpendicular to Stone Street. It’s a small and busy bagel joint, making fresh bagels in the back all day, every day. Get a bagel with the traditional “schmear” of cream cheese, go all-out with cream cheese, lox, capers and onions, or customize your own “deli” option. The hard part is choosing what kind of bagel you wish to consume (the most popular are: plain, sesame, “everything”, and whole wheat).